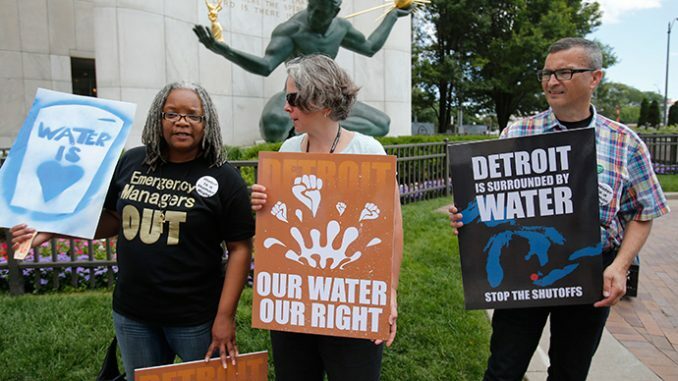 ‘The City of Detroit has once again begun shutting off water service for residents who are months behind on their bills. The move comes as a 30-day moratorium on shut-offs ended on Monday. According to the Associated Press, the city was scheduled to have crews out on Tuesday in order to commence with the controversial shut-offs, which are expected to hit 420 customers at first. So far, it’s unknown how many residents have actually had their service canceled. Detroit first began taking down water service in March, as thousands of residents were either months behind on their payments or owed hundreds of dollars. Between 15,000 and 19,000 customers had their water shut down since April, and almost 45 percent of all the city’s water accounts are classified as overdue. Is Bayer Poisoning Your Pet While They Kill the Bees?